Not sure if Ive managed to upload the correct puc from my phone. If not, I will edit this post. 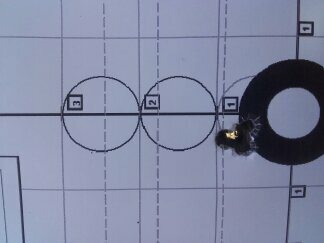 This 0.455moa three shot group @ 100m was shot with Brand new Thompson TC Compass fited with Tasco 3-9 scope. The rifle was bought from Taupo H&F yesterday morning. (I have been assisting a young friend into his first rifle). He also received a complimentary box of Remington 150gn Corlokt. I checked all screw torques before mounting the Tasco scope . We had access to a local farm range where we bore sighted, adjusted then fired the third forth and fifth shots as a group. We swabbed the barrel with Collings 90 after each shot and dried then allowed the barrel to cool. We then went on to run a ladder test using 150gn SGKs and with a medium load achieved a five shot group of .449 moa. I have used some very good rifles over more than fifty years and must admit to this being the best budget priced setup I have ever come across. Last edited by Woody; 17-03-2019 at 09:12 AM. Rock river arms hunter, erniec, 6mm ackley and 6 others like this. You would have to be happy with that rifle it sure can shoot well. My boss has one in 223. For a cheaper rifle man can it shoot! Nicely done there and good luck to the young fella!